Georgia Tech's Capstone Design Expo is the largest student design expo in the U.S. It is an opportunity for student teams to present their innovative ideas to solve real-world problems to industry, investors, and the public. This year, Georgia CTSA helped support 40 teams through funding from the Innovation Catalyst program. 226 teams competed in the 2018 Spring Capstone Design Expo. Kit Cath won best overall project at the 2018 Spring Capstone Design Expo. 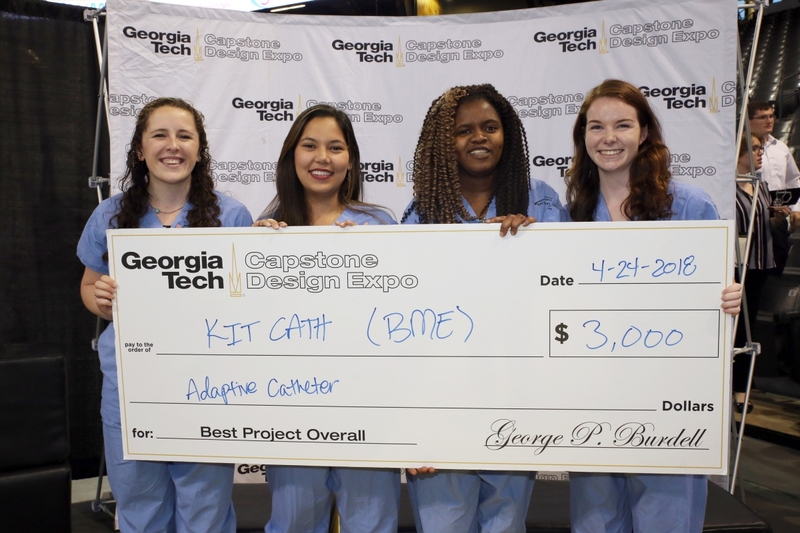 The Kit Cath team consisted of biomedical engineering (BME) majors, Kathleen Jordan, Lemou Tieyam, Diana Yunda, and Alexa Schlein. The Kit Cath team developed an adaptable catheter. The real-time shape-changing vascular catheter will reduce the need for catheter exchanges. NICUties won for biomedical engineering with their FixedFeed invention. The NICUties team consisted of biomedical engineering majors, Erika Plogstedt, Kylee McLain, Cecille Canary, and Cristina Quintero. Team NICUties developed FixedFeed, a neonatal nasogastric tube holder that prevents unplanned extubation and minimizes epidermis damage. Team member, Cristina Quintero said, "The idea for our product FixedFeed stemmed from the in-depth user research we conducted in the NICU environment, speaking at length with multiples nurses and parents of children in the NICU. Our findings concluded that there was a huge concern among both user groups for the children in the NICU and their ability to unexpectedly pull out their feeding tubes leading to abnormal feedings and skin damage. We bridged that gap between research and patient outcomes by developing FixedFeed, a user-focused solution with an intuitive design that immobilizes tubing while eliminating harsh adhesives to directly improve patient outcomes." Georgia CTSA’s Innovation Catalyst program aims to develop and implement training programs that will supply investigators with skills and knowledge to traverse the idea path. The program supports the BME Capstone Design program to meet this aim. The program is a series of courses offered to undergraduate BME students at Georgia Tech. Students work in teams to design, build, and test prototypes with real world applications. “I want to thank the Georgia CTSA for support of our Capstone program. BME has a spectacular showing each year…,” said James Rains, director, Capstone, Wallace H. Coulter Department of Biomedical Engineering, Georgia Tech and Emory University. The Georgia Clinical & Translational Science Alliance (Georgia CTSA) is an inter-institutional magnet that concentrates basic, translational, and clinical research investigators, community clinicians, professional societies, and industry collaborators in dynamic clinical and translational research projects. Emory engaged three of its close academic partners – Morehouse School of Medicine, Georgia Tech, and UGA – to form the Georgia CTSA. This partnership, a strategic multi-institutional alliance, offers compelling, unique, and synergistic advantages to research and patients statewide.